He points out a number of other strange things about the numbers. Viking eddas were found in Iceland that told the story of the Day of Ragnorook, the Doomsday of the Gods. At that time, 800 Divine Warriors will come out of each of the 540 Doors of Valhalla (800 x 540 = 432,000). The number can be found in an internal clock in the body, as well as in the Cosmos. A trained athlete's heart beats one time each second. In a 24 hour day, that is 86,400 beats. The earth's axis wobble that causes the precession of the equinoxes is given as 25,920 years. Divided by the ancient number called "soss," 60, which was used in calculations, results in 432. I have read elsewhere that the Kali-Yuga time cycle of the Eastern religions, is also 432,000 years (in some stories a different multiple). I once had a dream of a football game, that I knew was an anology to the Great Change at the end of the present cycle. There are 11 players on each team, for an 11:11, which some say is related to the opening of the Doorway in the Belt of Orion. My dreaming path suggests it is about Revelation 11:11, where the two olive trees/lampstands/prophets stand up after 3 and 1/2 days. It is a reference to the midpoint in the chakra system. The next step is the fourth, the Heart Chakra. The head coach in my dream was Mr. Webb, and the assistant coach was Mr. Noon. I started to write a check to Mr. Webb for my football equipment. There were threads in a pattern on the check, which I had to remove to sign it. The coach reminded me that the check was to go to Mr. Noon, because he had provided the equipment. As I was trying to interpret the dream, I realized - noon is half a day, 12 hours. 60 x 60 x 12 = 43,200 seconds! Also interesting, The Woman with Child in Revelation 12 has a crown of 12 stars. The New Jerusalem has 12 gates, angels, jewels and pearls. The symbol of the Heart chakra is a 12-petal Lotus Flower. John Mitchell, author of City Of Revelation, shows a diagram of the New Jerusalem Plan, based on St. John's vision. 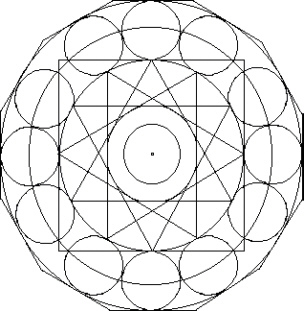 It has 12 circles in a ring, with a 12-pointed star inside, formed by four overlapping triangles. The Zodiac is often depicted in a similar way. If you take the circles to be 360 degrees each, it comes to 4,320. 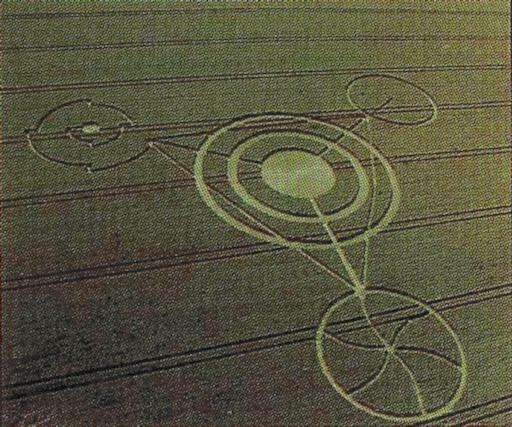 Crop circle researches report that a similar Plan is found by dowsing within certain crop patterns, as well as at ancient sites, such as Stonehenge and Avebury. 432 is part of a Gematrian numbering system, that seems to be based on adding the number 36. 1656 and 25920 are two of them. Others are 144 or 144,000, and 1260, which also appear in Revelation. Each number had an "Alpha" or word meaning. 432, for example, means "Consecration." Some believe that the numbers were encoded in the Bible to transmit messages across time itself. Carl Munck has shown that these numbers were part of a very ancient system for positioning ancient sites around the world. His friend, and mine, James Furia, has shown that the musical scale is related. The centering note is "A" at 432 cps, rather than the standard 440. "Also 'almost impossible', since the mathematical value of pi (3.14) is not supposed to have been calculated by any civilization until the Greeks stumbled upon it in the third century BC, is the fact the designed height of the Great Pyramid - 481.3949 feet - bears the same relationship to its base perimeter (3023.16 feet) as does the circumference of any circle to its radius. Equally 'impossible' - at any rate for a people like the ancient Egyptians who are supposed to have known nothing about the true shape and size of our planet - is the relationship, in a scale of 1 : 43,200, that exists between the dimensions of the Pyramid and the dimensions of the earth. Setting aside for the moment the question of whether we are dealing with coincidence here, it is a simple fact, verifiable on any pocket calculator, that if you take the monument's original height (481.3949 feet) and multiply it by 43,200 you get a quotient of 3938.685 miles. This is an underestimate by just 11 miles of the true figure for the polar radius of the earth (3949 miles) worked out by the best modern methods. Likewise, if you take the monument's perimeter at the base (3023.16 feet) and multiply this figure by 43,200 then you get 24,734.94 miles - a result that is within 170 miles of the true equatorial circumference of the earth (24,902 miles). Moreover, although 170 miles sounds quite a lot, it amounts, in relation to the earth's total circumference, to a minus-error of only three quarters of a single per cent." It seems clear that the number 432 has been within human consciousness for a very long time, and that it is often associated with a cycle of time number. This is the first update (other than links) of this article since July 7, 2002. I was inspired to complete the update by two recent developments, one of which involved an event that took place on January 8, 2007. The other was finding a connection between the Biblical number 1656 and the Mayan cycle number 1872 around the beginning of 2007. Also see John's web site: Alignment 2012. The 144000 days of each baktun period is "coincidental" with the Book of Revelation. And I heard the number of the sealed, a hundred and forty-four thousand sealed, out of every tribe of the sons of Israel, . . . The city lies foursquare, its length the same as its breadth; and he measured the city with his rod, twelve thousand stadia; its length and breadth and height are equal. He also measured its wall, a hundred and forty-four cubits by a man's measure, that is, an angel's. Note that the description indicates a cube with a factor of 12 measurement. This gives 12 x 12 x 12 = 1728. This is similar on a smaller scale to a cubic foot. It is often helpful to remove the ending zeros from the ancient numbers to simplify comparisons. The Mayan cycle, again, is composed of 13 periods of 144000 days each, for a total of 1872000 days. As reported in the article, Code of the Ancients, these types of Gematrian numbers all add to 9 or a multiple of 9 and are divisible by 9. The primary Gematrian numbers are evenly divisible by 36. Remember, from the first part of this article, that 1656 years is the time between the creation of Adam to the landing of Noah's Ark. The number 216 is half of 432 and equates to six cubed, or 6 x 6 x 6. The number 2160 is the length of one Zodiac Age in years. The number 216 is related to the number letters in the 72 Divine Names, which have 3 letters each, for a total of 216 letters. The fictional movie "Pi" featured the idea of the 216 Names of God, which have been lost. They must be found, so that the High Priest can say them inside the Holy of Holies on Yom Kippur to bring the Missianic Age and the the revival of the dead. This number coincidence with the Mayan cycle, therefore, seems quite significant. Droping the ending zeros, the basic figure is 4 x 12 = 48, and then, 48 x 66 = 3168. Finding the difference betwwen two of the key numbers from the Mayan cycle results in the "cube" calculation! This is actually obvious, since 13 x 144 = 1872, while 12 x 144 = 1728. But, the obvious did not become clear and meaningful to me until just now. Quite often events happen that appear symbolic and related to dream symbolism. I have been compiling evidence to support the theory for a very long time. Somewhat rarely, I report them in online articles, such as the tragic events of September 11, 2001. The ELF website has a letter about the subject that I sent years ago, under the title, "Dream Symbology Cosmology." A recent event happened that seems symbolic, and may have coded a number related to this article. Interestingly, the event is about birds, and birds were quite evident in the 911 events in several ways. For example, a great bird can be a reference to the American Eagle symbol and its meanings. A smaller bird with a branch in its beak threatening people can be a symbol of the terrorists, and their "branch" of Islam. On January 22, 2007, I received an e-mail with two links that reported two strange events. "It could be the plot of a horror film, but in two towns on opposite sides of the world the mysterious phenomenon of thousands of dead birds dropping out of the sky is all too real." "Three aviary pathologists at Texas A&M University independently concluded that parasites and a 10-degree drop in temperature killed the birds, said Dr. Lelve G. Gayle, the executive director of the Texas Veterinary Medical Diagnostic Laboratory." Just after reading the articles, Dee told me her morning dream. Some birds were being threatened by a poison powder substance coming down from light fixtures above. She took three birds in domed cages to save them. Each bird was of a different color; red, white, and blue. I mentioned the coincidence about the news story to Dee. We discussed the possible meanings of the dream. Dee had another recent dream in which there were three red birds dying. Of course, dreams of birds are quite common. We are well aware of the mystery of dead birds being reported all over the world. Could it be that this event and others contain dream/myth symbols as messages? About two hours later, another coincidence happened. I read an article by John Major Jenkins that mentioned a Mayan glyph of a "fallen Bird Deity" that represents the Big Dipper. The article concerns the end of the Mayan calendar in 2012 through a study of the monuments in the ballcourt at Izapan. I often find that the dates and numbers in a given symbolic event, seem to encode other symbolic messages. 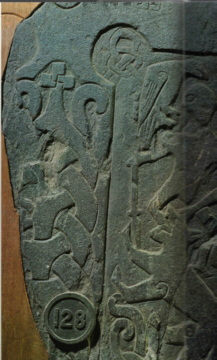 For example, there was a special number on the day I saw the Viking Carving from the Isle of Man depicting the Fenris Wolf devouring the god Odin on the Day of Ragnorook. The image also contained a coin-like object with the number 128 on it. I kept seeing the number all day long in different ways. Later, I added the date, August 30, 1990. Many related coincidental events followed. Note: As I was working on this part of the page, I started reading the Wikipedia article about the Isle of Man. I soon saw a graphic with the number 432 on it! It is a car registration plate, with the triskelion (three bent legs) symbol on it. The other coincidence was the time I saw the image, 1:28 AM, February 1, 2007. The number 49 is another type of cycle of time number. For an explanation of the interpretations, see the code page. The number 137 is associated with the fine structure constant and the alphanumerics of the Quabala. One interpretation is that birds represent the descent of deity into the field of time, or the messengers of the deity. The shamen of the world typically have a bird guide. 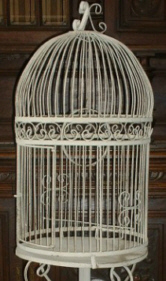 The domed cages in Dee's dream seemed quite important to me, because of the shape. I made a note of this several years ago while watching the animated film, Pinocchio. At one point, the little wooden boy is held prisioner in a bird cage. This event happened after he announced that he wanted to be an actor. The story fits with various metaphors about mankind. 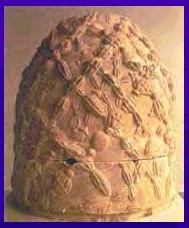 The bird cage, I realized, has the shape of the Omphalos, which is depicted above, right. The condition of mankind in the time cycle is "prisioner." The Pinocchio story seemed to pick up on the idea that we are all actors in the great theater of life. A related theme has to do with free will. In the time cycle in the lower three chakras, we do not have true free will. We are more like puppets on strings acting in the stage play of life, co-creating our realities unknowingly from the unconscious. One symbol of the condition is the "rabbit," as representing the unconscious dream realm. This is apparent in the story of Alice in Wonderland. Eventually, after the leap to the heart chakra, humans will become conscious co-creators. One symbol for this condtion is the name, "William," or derivations of it. The Germanic version is Wilhelm. The idea is the suggestion of having free "will" and being at the "helm" of one's own ship. Another symbol for this condition is "Lion King" and having "Royal Power." This corresponds, it seems, to Pinocchio becoming a "real boy." This article was last updated on February 5, 2007. This article was previously updated on July 7, 2002. The links in this article were last updated, and a few added on February 5, 2007. Note: This basic article was originally an e-mail that was posted on the Pufori site around 1996. I was on a starship in space with other people. An extremely important message was trying to come in but it couldn't until we first ejected the garbage. I ran frantically and managed to eject it. The message came in over a console with lights flashing. A doctor appeared and led the crew into a bedroom. He began to work on a yard-high mound of jelly-like substance at the foot of the empty bed. Suddenly, I saw a human-sized hand puppet, a male/female pair with only one hand-hole. They fell back into a vat of water. I went over and looked down at them under the water and knew they had to change. They had to change. It soon became apparent that the "mound of jelly-like substance" symbolizes our dome of the world perception of reality. Ancient people drew similar images based on the circle of the horizon with sky canopy. Years later, I learned of the Omphalos Stone, and realized it had the same type of meaning. It is considereed the the navel or hub of the world, like the axix mundi. Many places around the planet are said to be the center of the world. "I saw myself on the central mountain of the world, the highest place, and I had a vision because I was seeing in the sacred manner of the world." "But the central mountain is everywhere." That is a real mythological realization. It distinguishes between the local cult image, Harney Peak, and its connotation as the center of the world. The center of the world is the axis mundi, the central point, the pole around which all revolves. The central point of the world is the point where stillness and movement are together. Movement is time, but stillness is eternity. Realizing how this moment of your life is actually a moment of eternity, and experiencing the eternal aspect of what you're doing in the temporal experience -- this is the mythological experience. Jeff's dream indicates that the Omphalos, our perception of reality, will undergo a healing change. Blue Fairy who tells him he can become a real boy if he proves himself worthy by learning courage, kindness, and honesty. Steven Spielberg's film, A.I. : Artificial Intelligence (2001), based on a Stanley Kubrick project that was cut short by Kubrick's death, recasts the Pinocchio theme; in it an android with emotions longs to become a real boy. << 5. Stela 60. Depicts one of the Hero Twins standing over a fallen Bird Deity. The carvings and orientation of Group A indicate that this Bird Deity represents the Big Dipper to the north, rising and falling over Tacana volcano. In the Maya Creation Myth, the Big Dipper is Seven Macaw, the vain and false ruler of the previous World Age. The Hero Twins facilitated his downfall so that their father, One Hunahpu (a SOLAR lord), could be resurrected. Given the viewing orientation of the viewing seats and anyone standing in front of Stela 60, we are justified in suspecting that the solar rebirth will be found happening over the solstice horizon. And the December solstice itself is the rebirth of the sun in the annual cycle. But the Creation Myth, which is the subject of these carvings, is concerned with the shifting of World Ages, implying we must be sensitive to recognizing a much larger cycle of solar rebirth (a new �Sun� or �Age�). >> [End of excerpt] The "fallen Bird Deity" seemed coincidental. This seems to be the same as the Sumerian/Babylonian, "Storm Bird Zu," who had stolen the tablets with the fates of men. Marduke, who was given the title, "Lord," was the demiurge hero who chased down the Storm Bird Zu and retreived the tablets. In the earlier version, it was apparently Marduk's father, Ea/Enki, who defeated the Storm Bird Zu. This bird actually looks like a man with wings, i.e., the prototype for Satan. Austin dead birds died of natural causes Associated Press AUSTIN, Texas - Natural causes were to blame for the deaths of 63 birds found dead in downtown Austin last week, briefly sparking fears of a public health threat, a scientist said Thursday. Three aviary pathologists at Texas A&M University independently concluded that parasites and a 10-degree drop in temperature killed the birds, said Dr. Lelve G. Gayle, the executive director of the Texas Veterinary Medical Diagnostic Laboratory. "We eliminated our biggest concern: that there was a toxin or something that might be transmitted to humans," Gayle said. "We found no evidence that anyone should be concerned about a public health issue." Police shut down a 10-block stretch of Congress Avenue for several hours after the dead birds were found the morning of Jan. 8. Dozens of fire trucks, police cars and ambulances gathered and emergency workers donned yellow hazardous-material suits until the street was eventually reopened. 12-30-06 - DREAM - I went to a pet shop to buy some birds. The owner of the store tried to sell me some parrots. He was carrying two red parrots, but red is not my favorite color, so he handed me a yellow parrot and showed me how to hold it. I saw that he had a lot of long tail feathers hanging on the glass wall of his shop - all different colors. I told him I wanted to see all his birds. I saw that he had blue birds and white birds too. The white bird looked like a dove - not a parrot. I needed time to decide what color birds I wanted, and was thinking that red, white, and blue birds would be nice because it was patriotic colors. But I wondered if I would need two of each color to pair them up. while I was thinking about it, I saw 3 red parrots laying on their backs on the window sill. They were all dying. So I decided not to buy any birds at all. Officials say rescue teams have been dispatched to find a Indonesian passenger jet carrying 102 people after contact was lost during a flight Monday. Indonesia's transportation minister Hatta Radjasa says a distress signal was detected from the northern island of Sulawesi. Air traffic controllers say they lost contact with the Adam Air Boeing 737 jet while it was flying at 10,000 meters. Ninety six passengers and a crew of six, including 11 children were on board. The report of the Austin, Texas event seemed symbolic. appears in the drop in temperature and the 10-block area. government connections, including the symbolism of realms that govern the reality. the Lone Star Quilt pattern, i.e., the Unity Star. The number 16056 is quite suggestive to me, as related to the Gematrian number 1656. The numbers have the same tangent, as is typical with these numbers. of 144000, which is part of the Book of Revelation. number of seconds in one day. 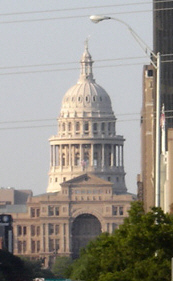 Austin is the capital of the U.S. state of Texas and the county seat of Travis County. Situated in the region of Central Texas, it is the fourth-largest city in Texas and the 16th-largest in the United States. As of the 2005 U.S. Census estimate, Austin had a population of 690,252. The city is the core cultural and economic center of the AustinRound Rock metropolitan area with a population of 1.4 million. The first documented settlement of current-day Austin occurred in 1835, and the site was named Waterloo in 1837. In 1839, Mirabeau B. Lamar renamed the city in honor of Stephen F. Austin. Its original name is honored by local businesses such as Waterloo Ice House and Waterloo Records. from the Congress Avenue Bridge over Town Lake. Round Rock is a city located in the U.S. state of Texas within Williamson County of the AustinRound Rock metropolitan area. As of the 2000 U.S. Census, the city had a total population of 61,136 (though the 2005 census estimate placed the population at 86,316). In 1851 a small community was formed on the banks of Brushy Creek, near a large round rock located in the middle of the creek. This round rock marked a convenient low-water crossing for wagons, horses and cattle. The first postmaster called the community Brushy Creek, but in 1854 the small settlement was renamed Round Rock in honor of this now famous rock. The "round rock" is located near Chisholm Trail Street in the middle of Brushy Creek. After the Civil War, Jesse Chisholm began to move cattle from South Texas through Round Rock, on the way to Abilene, Kansas. The route he established, which crossed Brushy Creek at the round rock became known as the Chisholm Trail. Most of the old buildings, including the old Saint Charles Hotel are still there today. This historic area is now called "Old Town". Downtown Round Rock is the site of the gunfight and subsequent capture (then death) of the nineteenth-century American train robber, Sam Bass, by the Texas Ranger Division on July 19, 1878. The event is known locally as the "Sam Bass Shootout". Bass is buried in Round Rock Cemetery, located northwest of "Old Town" on Sam Bass Road. The town itself was named after the French ship, the L'Espérance, commanded by Bruni d'Entrecasteaux. Esperance, roughly translated, is French for 'hope'. In January 2007, Esperance was struck by two highly unusual events. First, a torrential storm with wind gusts of up to 110km/h brought 155mm of rainfall within 24 hours, causing significant flooding. More than 100 homes were damaged, several boats were destroyed, trees were felled and 35m of bridge on the South Coast Highway, the main road linking Esperance to Perth, was washed away. The Western Australian Government declared the area a natural disaster zone. Over 37,000 sheep were killed in the storm. Secondly, commencing just before the storm, thousands of birds (including wattle birds, yellow-throated miners, New Holland honeyeaters and singing honeyeaters, and some crows, hawks and pigeons) fell dead from the skies. As at 10 January 2007, no scientific explanation had been arrived at for the cause, man-made or natural, for the phenomenon. generally, including the male/rational and feminine/intuitional aspects. half a day, 12 hours. Sun in relation to the Great Pyramid's dimensions, then the following obtains:"
about the number 378 that is related to the Romans and Aztecs. x 260 = 22464000 "
x 354 = 30585600 "
x 360 = 31104000 "
x 364 = 31449600 "
x 365 = 31536000 "
x 365.25 = 31557600 "
ancient numbers of the maya and China. the different rates of motion of the Sun as given above. which I am including in the update of the 432 page. The number 129600 is 360 squared and 5 cycles of the Zodiac Ages (5 x 25920). The number 1296 is 36 squared, or 6 to the fourth power. "my" main number because of the chits and related coincidences. prime and Hoagland's e' prime. Is it a coincidence that this fits with the 24 hour day and the number of dead birds? 1800 - 216 = 1584, another important Gematrian number. The last number fits in a certain way in my figuring for the six ages. how the numbers 693, 756 and 819 are significant to one another through a 63c. Down the page are three pyramids with the final one having the number 2268. 12 x 12 x 12 = 1728. This is similar on a smaller scale to a cubic foot." 48 x 36 = 1728, which I mentioned before about the cube idea. I will be adding these ideas to the article. are related to "revival of the dead" and being restored to life by the "breath." with words, restoring his spirit, and with letters, reviving his entire body enduringly. came out to the right number of weeks, 86400. It is off a bit. of the 72 Divine Names for the 432 article update. There's more. Max's computer, which occupies most of his apartment, crashes, leaving behind a printout of random numbers. He throws them away. Are these numbers the secret 216-digit number that the Kaballah sect is looking for? The meaning of this number is very clearly explained, with the history of the Jewish temple and the priest's annual visit to the holy of holies on Yom Kippur. 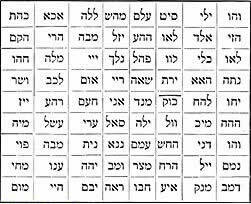 The number may be translated into the Hebraic equivalent of what the priest said: the name of God. The theme of the movie Pi is more reality than fiction, as Joe Mason states so well in his comments. Joe, I noticed in your page you talk about the relationship scale of the dimensions of the Great Pyramid compared to the dimensions of earth as 1:43,200. "Equally 'impossible' - at any rate for a people like the ancient Egyptians who are supposed to have known nothing about the true shape and size of our planet - is the relationship, in a scale of 1 : 43,200, that exists between the dimensions of the Pyramid and the dimensions of the earth." If you do divide this in half (2:43,200) it is 21,600 ! As you say also on this web page "And, 21600 also "happens to be" the number of Nautical Miles on the polar circumference of Earth. " God is great and the numbers belong to HIM ! Yes! That IS a significantly meaningful number "coincidence." Thank you for pointing it out. I forwarded your e-mail to my "Code" partners. This is derived from the total of 60 original stones arranged in a 360-degree circle (60 x 360). The number 72 is also related to the number of Divine Names. 44 x 72 = 3168, which was related to "Lord Jesus Christ" by early Christians. The harmonic, 31,680 (6 miles in feet), was a sublunar distance related to The New Jerusalem. It is derived from a box drawn around the earth, giving 4 x 7920 miles = 31,680 miles. It is also derived from a diagram of the moon touching the earth, with a large circle around the earth that passes through the center of the moon. The circumference of the large circle is 31,680 miles. The harmonic of 44, 440, is the number of yards in a quarter-mile. It is also the cycles per second of the central "A" note of the piano. The "Trinity" total, 3 + 41 + 44 = 88, has other interesting "connections." 88 x 360 = 31,680, and 88 x 60 = 5,260 (feet in a mile). I became interested in ancient numbers back in 1991, when I read an article about John Michell in a crop circle journal, and then read another written by him. I was startled by the first article, when I saw "The New Jerusalem Plan" diagram. I had dreamed of the shape the previous year! And, I have never been a believer in any belief system! The basic pattern of The New Jerusalem Plan, according to the article, has been found by dowsing in ancient sites such as Stonehenge, Avebury, and Glastonbury, and also within a crop circle formation. John included the diagram in some of his books: "City of Revelation," "The View Over Atlantis," and "The New View Over Atlantis." The total square footage of the circles was 31,680. Some say the formation is related to the Trinity. Well, I am more of a "believer" now! If you wish, you can post my e-mail address and the link to our Code of The Ancients portion of our site on your site. The concepts in "Pi," the movie, do have a "reality." It seems important to share the ideas with others, even if we disagree on the ultimate interpretations. Thanks for your part of that effort. "...Hindu sacred epics and puranas (popular tellings of ancient lore) the number of years reckoned to the present cycle of time, the so-called Kali Yuga, is 432,000; the number reckoned to the `great cycle' (mahayuga) within which this yuga falls being 4,320,000." "...in the Icelandic Eddas, I discovered that in Othin's(Wotan's) warrior hall, Valhoell, there were 540 doors, through each of which, on the `Day of the Wolf' (that is to say, at the end of the present cycle of time), there would pass 800 divine warriors to engage the anti-gods in a battle of mutual annihilation. 800 x 540 = 432,000..."
"in Babylon, I then recalled, there had been a Chaldean priest, Berossos, who, c. 280 BC, had rendered in Greek and account of the history and mythology of Babylonia, wherein it was told that between the time of the rise of the first city, Kish, and the coming of the Babylonian mythological flood (from which that of the Bible is taken), there elapsed 432,000 years..."
432,000? Julius Oppert, a distinguished Jewish Assyriologist of the last century, in 1877 presented before the Royal Society for Sciences in Gottingen a paper on `Dates in Genesis,' in which it was shown that in 1656 years there are 86,400 seven-day weeks. 86,400 divided by 2=43,200." "And so it appears that in the Book of Genesis there are two contrary theologies represented in relation to the legend of the Deluge...The other idea, which is in fundamental contrast, is that of the disguised number, 86,400, which is a deeply hidden reference to the Gentile, Sumero-Babylonian, `mathematical' cosmology of the ever-revolving cycles of impersonal time, with whole universes and their populations coming into being, flowering for a season of 43,200 (432,000 or 4,320,000) years, dissolving back into the cosmic mothersea to rest for an equal spell..."
"It is to be noticed, by the way, that 1+6+5+6 =18, which is twice 9, while 4+3+2=9; 9 being a number traditionally associated with the Goddess Mother of the World and its gods. In India the number of recited names in a litany of this goddess is 108. 1+0+8=9, while 108 x 4=432 [my note, the number of mantra typically said in one round of a Buddhist mala is also 108]. In Roman Catholic Europe, when the Angelus tolls (at morning, noon, and evening), it rings 3+3+3 and then 9 times, in celebration of the Virgin's conception of the Savior. The recited prayer at those junctures, 'The angel of the Lord declared unto Mary, and she conceived by the Holy Ghost.... and THE WORD WAS MADE FLESH...'is in recognition of this miracle at the opening of a new world age. In ancient Greece, 9 was the number of the Muses, patron goddesses of the arts. They were the daughters of Mnemosyne ('memory'), the source of imagination, which in turn is the carrier of archetypal, elementary ideas to artistic realizations in the field of space-time. The number 9, that is to say, relates traditionally to the Great Goddess of Many Names (Devi, Inanna, Ishtar, Astarte, Artemis, Venus, etc. ), as matrix of the cosmic process, whether in the macrocosm or in a microcosmic field of manifestation." "...the slow westward motion, in the course of years, of the equinoctial points around the beltway of the zodiac (the vernal equinox, for example, moving from the sign of Aries, where it had been before the birth of Christ, through Pisces, where it is now, toward, Aquarius, where it will be in a couple of hundred years), requires for one complete cycle of the twelve zodiacal signs exactly 25,920 years, which term is known as a `great' or `Platonic' year. But if we divide 25,920 by 60 ( which is the ancient Mesopotamian `soss,' or basic sexagesimal unit of astronomical measurement, still used in the measurement of circles, whether of time or space) the quotient is 432. Moreover: 2+5+9+2+0=18." "...And so, indeed, in our modern Western world, when a doctor takes a patient's pulse, if the beat is sixty a minute (43,200 in twelve hours), it is the pulse of a conditioned athlete in accord at once with his own nature and with the rhythm of the universe; the function of medicine, like that of mythology and ritual, being to keep mankind in accord with the natural order." To give a sense of the real meaning of this agricultural mythology, one must examine the actual number of years it takes for the spring equinox to pass through all the signs of the zodiac. Called "the procession of the equinoxes," it takes 25920 years to complete a cycle of the zodiac. Divide that by 60 and you get 432. This number, as we shall see, provides the link between the agricultural mythology and the actual cycles of time. Some years ago a friend of mine gave me a book, Cooper's Aerobics, that told how many laps a man would have to swim every day in order to stay healthy. A footnote read: "A man in perfect physical shape, at rest, has a heartbeat of about one beat per second." At sixty seconds to a minute and sixty minutes to an hour, in one day of twenty-four hours, the heart beats 86400 times (half of which is 43200). The heartbeat matches the beat of the universe; They are the same. That coincidence of rhythm was the point of the old cosmic mythologies. The latter envisioned this microcosm, or little cosmos, and the macrocosm, or big cosmos, as resonating to the same beat. When a person tells the doctor "I've got a fever," the doctor takes his pulse to see if it registers in harmony with the 43200 beats--that is, to find out if the patient is in tune with nature. These numbers, anchored in the sumerian discovery that the order of the universe can be discovered mathematically, are found almost everywhere. In the Hindu sacred epics, the number of years calculated to the present cycle of time, the Kali Yuga as it is known, is 432000, the number of the "great cycle" (mahayuga) being 4,320,000. In the Icelandic Eddas, one reads of the 540 doors in Othin's (Wotan's) Hall through which, at the end of the cycle of time, 800 divine warriors would pass to battle the antigods in that "Day of the Wolf" to mutual annihilation. Multiplying 540 by 800 equals 432000. An early babylonian account translated into greek by a babylonian priest named berossos in 280 B.C., tells us that 432000 years passed between the time of the rise of the city Kish and the coming of the mythological flood (the biblical story derives from this earlier source). In a famous paper on "Dates in Genesis," the Jewish Assyriologist Julius Oppert, in 1877, showed that in the 1656 years from creation to the flood, 86400 weeks (i.e. the span of creation in the first chapter of genesis) had passed. Again, half of which produces 43200. That's a hint, buried in Genesis, that two notions of God are to be found in its pages. The first was the willful, personal creator who grieved at the wickedness of his creatures and vowed to wipe them out. The other God, in complete contrast, is found hidden in that disguised number 86400, a veiled reference to the gentile, sumero-babylonian, mathematical cosmology of cycles, ever recurring, of impersonal time. During this cycle, kingdoms and peoples arise and recede in seasons of the multiple of 43200. We recall that the jewish people were exiles in babylon for half a century and could, indeed, have absorbed these notions that, exquisitely hidden, provide a subtext of recurring cycles of time in their scriptures. The mysterious procession of the night sky, then, with the soundless movement of planetary lights through fixed stars, had provided the fundamental revelation, when mathematically charted, of a cosmic order. The universe as living being in the image of a great mother, within whose womb all the worlds, both of life and death, had their existence. The human body is a duplicate, in miniature, of that macrocosmic form. Throughout the whole a secret harmony holds sway. It is the function of mythology and relevant rites to make this macro-microcosmic insight known to us just as it is the function of medicine (recall the 43200 beats of the heart every 12 hours) to keep us in harmony with the natural order. These old mythologies, then, put the society in accord with nature. Their festivals were correlated with the cycles of the seasons. That also put the individual in accord with the society and through that in harmony with nature. There is no sense of tension between individual and society in such a mythological world. The rules as well as the rituals of such a society put persons in accord not only with their social world, the world of nature without, but also with their own human nature within. Note: The calculation of 86,400 weeks in 1,656 years seems to be an approximation. The on-line calculator gives a value of 604,841 days, which is 41 days too many, that is, 86,405 weeks plus six days. [from above] Note: As I was working on this part of the page, I started reading the Wikipedia article about the Isle of Man. I soon saw a graphic with the number 432 on it! It is a car registration plate, with the triskelion (three bent legs) symbol on it. The other coincidence was the time I saw the image, 1:28 AM, February 1, 2007. I then figured: 1656 - 1528 = 128 !!! Twice 18 is 36 and half of 72 is 36. It is quite significant that 1989 was 23 years before 2012. I don't remember if I figured this before. Figuring from 21 December, there are 8401 days, so the 8400 are the days between, not counting the first and last. 1200 weeks is 8400 days. Certain ranges of 23 years come out to 8400, such as 1992 to 2015 (see below). The leap year days make the difference, of course. 2012. But, in this workshop he had said nothing of it, so walking across the lawn with him on the way back toward the hall I asked him about it. In a jovial mood he said, "Better hurry, only twenty four years to get ready." I ran a quick calculation in my head and said, "Ugh, no, twenty three years... exactly," looking at the date on my watch. Then noticing it was 11-23 that day I added, "What do you know about twenty three?" "Oh that goes back to ancient Persia," he said obliquely as we reached the seminar room, ending the conversation.